Part of the Iconic living we so often talk about here at Mums in Heels is all about living a life where we feel inspired, confident, and thriving. One where we choose what feels right for us everyday, not for the purpose of impressing those around us, but as a way of staying connected to our most precious self which ultimately gives us the energy to create, spread love, face challenges without losing our cool, and soar to new heights. We try to create our own rules and live in the space of feel good & look good balance (sometimes the other way around). Many women ask us how we achieve that glow and attitude, the good mood and the good vibes day in and day out….. Well, we decided to let you inside our world. We can’t promise any kind of a magic wand or a big secret, but instead we can share with you the small steps, and encourage you to make the conscious daily commitment with us. Those small steps are how we work towards achieving our best self and putting her on her way to achieving her goals. This one is by the founder Tsitaliya Mircheva. It all started with a naïve green smoothie recipe I tried at home (you know the usual spinach and avocado with coconut water and some green probiotic powder), then it became a daily habit of making one green smoothie every singe morning using the Welleco powder. In the last several months it has become a passion of mine to create homemade nutritious drinks that fuel my body right: from freshly squeezed apple juice and ginger to adaptogenic toners. I have at least three refreshing drinks a day. I am finding it better than meditation right now. Playing with such colorful foods and blending them into easily absorbable liquid self love brings me back to my ZEN point. And it is when we are balanced and centered, the magic happens amongst the chaos. I usually start my day with my favorite green smoothie (recipe to follow), then I have an early afternoon protein shake or a warming golden milk, and finally come late afternoon, when the sugar cravings kick in, I make my adaptogenic toner. Now this may sound a little time consuming – how do I find the time for all these? You will be surprised how easy it can be. I keep the recipes on my fridge door and believe me they are so easy and enjoyable to make and drink. Plus, after you start to see how they can transform your health and make you feel – you will realize it is totally worth the commitment, you are worth it! If I am going to be out the whole day, I just make them “to go” in the morning and put each one in a jar with a straw and I take it with me to work. The other questions you might be asking by now is what is adaptogenic toner and golden milk? Adaptogens’ biggest superpower is to protect the body from the toxic effects of stress, which is arguably the biggest health issue of our time. We live in a world with information at our fingertips and sometimes it feels as though this pace translates into life. The term adaptogens was actually coined by the Soviet Union’s Ministry of Health way back in 1947—referring to a class of herbs and mushrooms that offer heavy-duty support for the body’s natural resistance to “adverse influences,” explains Ric Scalzo, the CEO and founder of Gaia Herbs (you might just call him adaptogens’ head cheerleader). Those influences include anything that taxes the body, from illness to working out (like when you don’t take your rest days) to straight-up stress. An adaptogenic toner is something you can make alone at home and there is nothing secret and complicated about it. I use 1 tbsp Reishi powder, vanilla extract and cinnamon according to my taste, stevia and a cup of Drangon Herbs Spring Dragon Tea. The recipe I read on Well + Good suggest as well Ormus and Mesquite, but I don’t use them. I like to top my drink with cacao nibs. Cacao is one of the best sources of magnesium, also contains fiber, iron, and antioxidants, and is a known mood improver (without the added sugar found in cocoa!) Cacao also has PEA, this helps us focus and anandamide, a lipid also know as a “BLISS” molecule. There are two ingredients that may have adverse effects if overused, so like anything else everything is best in moderation. One is a nervous system stimulant and another may reduce the body’s absorption of calcium. The Golden milk is the best immune system booster I know. I make it with two cups of almond milk, 1 teaspoon Turmeric, ½ teaspoon cinnamon, tiny piece of fresh ginger root or powder, raw honey to taste and pinch of black pepper. Some people add cayenne pepper, but that’s too much for me. I blend the ingredients first and then warm it in a small saucepan for 3 to 5 minutes but on low heat without letting it boil. 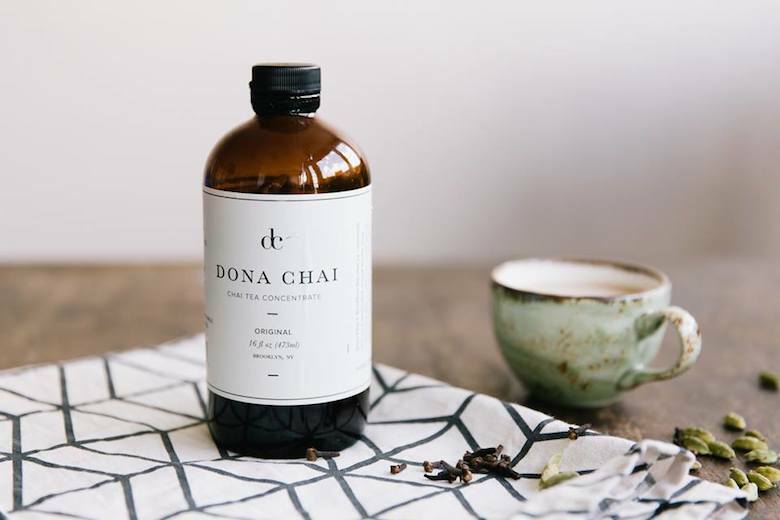 Another way of making this magic drink for autumn and winter is by using a ready- made blend and I love the Dona Chai concentrate. It is pure bliss in a bottle! It is so aromatic and so sensual, it has a unique blend of spices that upon one sniff I am transported inside to that feeling I get sitting in front of a warm fire wearing my favorite snuggly sweater this time of year. As for my recipe for green smoothie, I am warning you I play no games when it comes to my health. In the beginning all of this may take some planning ahead and investigation of local supermarkets to find key ingredients but let me remind you to start small, enjoy the process, and fuel that blessed body of yours this winter!